Seth Barrett Tillman points us to a ranking developed by HeinOnLine. I'm all about citation studies these days having just - if I may boast - chalked up my thousandth in Westlaw's law review database. The Hein study is both plausible and a little controversial, so I'm sure you'll want to take a look - at the top are Posner and Sunstein, but lower on the list are prominent, but interesting crim, enviromental, philosophical, and other scholars. Hein says that its "list is calculated based on an analysis of all articles in HeinOnline. We then ranked each author in each category: number of times cited by articles, number of times cited by articles written in the past 10 years, number of times cited by cases, and number of times accessed and averaged the rankings to produce this list of the 250 authors that scored the highest when averaging all categories." I can't really figure out the denominator in this chart expressing the three year performance of university endowment managers, who are apparently paid too much (that's the gist of the story). And they are probably underperforming an S&P index over that period. But if the returns to these managers are annualized? Most big universities are able to get their lumbering endowments to do 11-12% a year? In return for a couple of million bucks in compensation? Promising that kind of return for your gold/real estate play usually constitutes grounds for prosecution by the SEC. 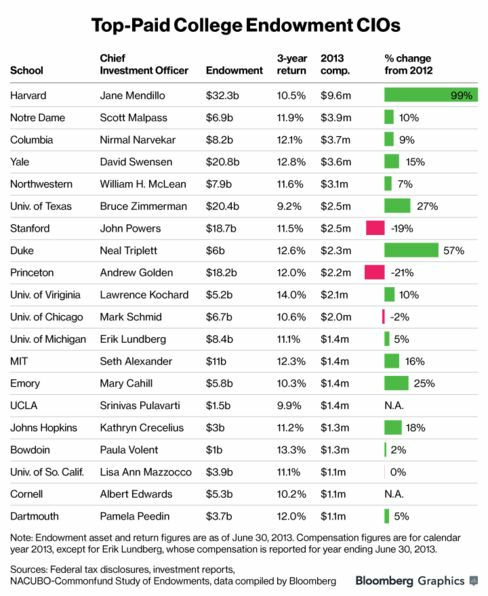 Also interesting: Emory and Notre Dame have more money that Cornell, Dartmouth, and UVA. Why Did SEC Commissioner Aguillar Dissent In An Enforcement Case? Enforcement cases, where the enforcers have total discretion about what to do, don't often motivate dissents from one of those enforcers, but one did recently before the SEC, in a case where a CPA CFO misstated earnings, and agreed to a Rule 102(e) suspension, or, if you like, a "wrist slap." Commissioner Aguillar thought that the CPA role was crucial. Accountants—especially CPAs—serve as gatekeepers in our securities markets. They play an important role in maintaining investor confidence and fostering fair and efficient markets. When they serve as officers of public companies, they take on an even greater responsibility by virtue of holding a position of public trust. Aguillar appears to be worried that CPAs are getting pled down into relatively innocent offenses even when there is strong evidence of intentional fraud. So there you go, a commissioner who is particularly insistent on holding the accounting profession to high standards, and thinks the SEC is too willing to plead down everything. As an empirical matter, it is difficult to know whether the SEC is indeed guilty of Aguillar's charge (though he is, presumably, an expert on the matter). It's hard to know how much conduct is going unprosecuted, and for settleed cases, whether stiffer charges would have been likely to stick. With a hat tip to Corp Counsel, this story about Milton Webster, board member of the Chinese firm AgFeed, who blew the whistle on his company, is really unique. He was a member of the audit committee! He thought that a name brand law firm was more conflicted than solution-oriented! He resigned, and then went to the authorities (or, at least, the paintiffs)! I don't think I've ever heard of a member of the firm's audit committee dropping a dime on the firm he directs. You'll want to read this probe by Francine McKenna, but here's the Bloomberg long read as well. If Treasury Prioritizes Debt Repayments After Reaching The Debt Ceiling, Can Anyone Sue? With the possiblity of debt ceiling default arising quarterly these days, it is worth thinking through the Article III consequences of prioritizing debt payments over its other obligations. Can Treasury do that without facing a ton of big, fat, lawsuits? [W]hy is Matt Yglesias so convinced that prioritization is impossible? He gives four reasons. The first is that prioritization is illegal: “Treasury is not authorized to unilaterally decide to pay certain bills and not others”. This is true — but also a bit irrelevant. Treasury is under unambiguous Congressional orders to pay lots of bills — all of them, in fact. If it fails to pay those bills, it will be violating the law as laid down by Congress. Hence the 14th Amendment argument that the president should simply ignore the debt ceiling entirely, if it comes to that. But underneath it all, it’s hard to credit any argument which says “Treasury isn’t allowed to pay its own bonds”. If that’s what Treasury wants to do, then surely it can do so. Besides, who would even have standing to sue? an agency's allocation of funds from a lump-sum appropriation requires “a complicated balancing of a number of factors which are peculiarly within its expertise”: whether its “resources are best spent” on one program or another; whether it “is likely to succeed” in fulfilling its statutory mandate; whether a particular program “best fits the agency's overall policies”; and, “indeed, whether the agency has enough resources” to fund a program “at all.” Heckler, 470 U.S., at 831, 105 S.Ct., at 1655. As in Heckler, so here, the “agency is far better equipped than the courts to deal with the many variables involved in the proper ordering of its priorities.” Id., at 831–832, 105 S.Ct., at 1656. Dan Doctoroff is giving $5 million to the law school in Hyde Park to develop a law and business curriculum, which isn't exactly a vast amount of money, but congratulations to UC nonetheless. Like Wharton, Chicago has a 5-years-in-4 MBA-JD program already; there is a lot of happiness about the program in these parts, but it does require students to pay a ton of tuition, and compresses their schedule flexibility massively. It sounds the Doctoroff donation will permit law students to take classes at Booth, or maybe buy out some Booth teachers to teach a class exclusively comprised of law students on asset valuation, managerial economics, and &c.
One bridge that must be crossed for such classes concerns the basic level of knowledge of the law students. Some Wharton students are coming from the army or Teach For America, but most have been spending a few years working on spreadsheets and going through quarterly statements. This sort of thing provides a critical background (and a culture spreadable to those who are abandoning their careers in ballet or publishing) that just being smart and eager does not, and my case study for that would be the accounting for lawyers classes you might have taken in law school, and promptly forgot about. Good luck to Chicago as it seeks to deliver classes that law students can find instructive; oddly enough, it might be easier to focus on undergraduate finance offerings rather than on the MBA program. Q&A with Frank Partnoy on 'What's Inside America's Banks"
In the recent edition of The Atlantic, Frank Partnoy (law & finance professor at the Univ. of San Diego who recently wrote Wait: The Art and Science of Delay) and Jesse Eisinger (a journalist with ProPublica and columnist for the New York Times DealBook) authored What’s Inside America’s Banks?. They present an extensive analysis of the public disclosures made by major banks. The centerpiece of the article was an effort by Partnoy and Eisinger to unpack and understand the annual statement of Wells Fargo, a large bank that has been less associated with complex derivatives and trading activities than firms such as JP Morgan, Citi, and Goldman Sachs. They conclude that the public securities disclosure makes it impossible to understand adequately the risk-taking of even a more “traditional” large bank. Q: You paint a pretty bleak picture of opaque disclosure and potential hidden time bombs lurking in the balance sheets of big banks. How does this problem compare to the toxic assets hidden in Japan’s zombie banks in the 1990s after their real estate bubble collapsed? Q: Is this a post-crisis phenomenon? Is it a function of banks trying to hide bad assets from before the bubble burst? Did the problem start there? A: Yes, and I think it’s a friendly amendment to Charles Kindleberger’s work on crises, or even Hyman Minsky’s. As the bubble builds, credit expands, and risk increases, and inevitably the banks at the center of the expansion increasingly hide their risky assets. The assets aren’t necessarily bad – at least not at first – but they are hidden because they are risky. Then there is a dislocation and a panic as the assets “become” bad and ultimately the losses are disclosed. Q: Is the opaque disclosure a sign that the United States runs the risk of a zombified banking sector like Japan’s? A: That remains unclear. Bank stocks have performed well recently, in part because of the faith in the implicit U.S. government guarantee. Japanese banks weren’t as fortunate. But we think the risk is a real one, and it was a major reason why we wanted to write the piece. I don’t know if the right metaphor is zombie or rot or something else, but historically opacity has been at the center of major financial problems, especially over the long term. Q: Do you have a sense whether the problem is as acute for large banks overseas – the Barclays, UBSs, and Deutsche Banks of Europe? A: The gap between disclosure and reality is not nearly as wide in Europe, though banks there have plenty of other problems. For example, European regulators and bankers continue to rely heavily on credit ratings; that is a huge ongoing problem and will almost certainly result in massive misallocation of capital and future crises. Q: You don’t seem to have much confidence in the ability of regulators or even bank management to understand the risks these banks are taking despite having nonpublic information. Is there other evidence of this besides the London Whale tale of JP Morgan? A: Oh, there are so many. Regulators have failed to comprehend the risks at banks over and over during the previous two decades. My book Infectious Greed documents many of those incidents from the 1980s through 2003. As for more recent examples, the recent revelations about what Fed officials thought in 2007 is notable. So are the regulators’ positions about risks at Citigroup in late 2007 and early 2008. I attended several conferences with regulators during 2007-08 and was surprised by how little they knew about Structured Investment Vehicles. And so on. Kids, you really need to get out more. Q: Why did Warren Buffett invest in banks after the crisis? What could he figure out that you (or other investment fund managers you interviewed) couldn’t? Did he have special access? Why is Berskshire Hathaway still invested in Wells Fargo if the disclosure is so opaque? A: Buffett obviously has special access and his bet turned out to be a good one last year. He’s experienced investing in companies with opaque derivatives exposure, going back to General Re, and while sometimes he is warning that derivatives are financial weapons of mass destruction he is also often profiting from them. The key to Buffett’s investing style has always been timing – he is a genius at managing delay, waiting for the “fat pitch,” and I suspect he’ll know when it’s the right time to unload bank stocks so that he doesn’t get burned again. He understands that just because something is a black box doesn’t necessarily mean you should avoid it. Even buying into a pyramid scheme can be very profitable if you get the timing right. Q: Why wouldn’t the market address this? Wouldn’t one large bank collect new investors and be able to sell equity above book value by offering better disclosure? A: Oh, you’re right – how silly of me. The market addresses all such problems. Never mind. Q: If this opacity scares away equity investors, why isn’t it also scaring away the creditors and derivative counterparties of these big banks? Why aren’t they demanding more margin or collateral or higher effective interest rates? Do these counterparties assume that the problem would have to be large enough to threaten the big bank? A: Implicit government guarantees. And even so, they are demanding more collateral and clearer contractual arrangements, which are creating another set of problems. Also, there is some truth to the notion that the banks are so large and diversified today that creditors and counterparties probably aren’t at huge risk of failure. Catastrophe yes, but maybe nothing so big to cause insolvency. JPMorgan’s $6 billion loss was a nit. Q: You offer a detailed indictment of Levels 2 and 3 of fair value accounting. What did you make of the outcry during the financial crisis that mark-to-market accounting was exacerbating the crisis by causing fire sales? Might some of the reforms you suggest, including improving fair value disclosure, have nasty procyclical effects? A: No, quite the opposite. The outcry during the crisis was about marking down assets to more realistic levels – obviously bank managers didn’t want to do that. But if managers had understood they would be required to mark assets down immediately when they declined in value, they would have been less likely to buy them during a bubble – hence, an anti-cyclical effect. The smartest investors and managers say that if you can’t mark something every day, you shouldn’t buy it. Period. Does this mean that you are skeptical of the Volcker rule’s effectiveness in reducing risk-taking because the built-in statutory exceptions to proprietary trading are too easily manipulable? A: Absolutely. I use the metaphor of a piece of Swiss cheese with holes that get bigger and bigger – until it is gone. Q: Are you really limiting your proposed fixes to better disclosure and more vigorous securities enforcement? Or are you saying, as Felix Salmon blogged, that banks need to become much simpler? Do you agree with his assessment that moving back to a simpler age of banking or a simpler age of disclosure is quixotic? Q: Doesn’t disclosure still have the “you can lead a horse to water…” problem? Would even sophisticated investors demand or make use of the disclosure you envision? How do you know? A: True. Some of the reception to our piece has made me wonder whether some supposedly “sophisticated” investors are in fact not wearing any clothes. On the Wells Fargo earnings call after our piece was published, one person asked about it, but the various investors and analysts seemed placated by the CEO’s response that Wells Fargo is “pretty plain vanilla” and “I’ve never seen us be more transparent.” There’s been virtually no follow-up about the bank’s Variable Interest Entity disclosures, for example. But I think there are enough truly sophisticated investors out there, and they have huge amounts of wealth under management – as long as they drink, the other horses eventually should come along. And the most sophisticated investors tend to pile on very effectively once even one of their ilk has made a good case. Which is why managers hate (and fear) them so much. Q: Are you coming out in favor of principles in the old rules vs. principles debate on accounting standards? Aren’t simple, broad standards also subject to gamesmanship? A: Yes, I am. It is much more difficult to game broad standards when they are adjudicated ex post. This after-the-fact element is just as important as rules vs. principles. A: It’s a fantastic project, and I wish you the best with it. In theory, technology can vastly improve the quality of disclosure. But one problem with systematizing disclosure is that you can miss crucial angles that are “outside-the-box” or more like narrative. What would XBRL have done with Enron’s footnote 16? Q: If you were to offer a few concrete suggestions for the new SEC Chair on improving disclosure and enforcement, what would they be? A: Keep it simple and be willing to be vague. Single out financial firm disclosure as a hot topic, and make it clear that banks must make better disclosures of risks and worst-case scenarios, or face consequences. Get the board members of the major banks to sign on to these initiatives, through a series of early meetings and then a highly-publicized roundtable. Keep trying to win “should have known” cases, especially against employees of financial firms. Good luck! The last time the EU reversed a merger approved in the US was Honeywell-GE in 2001. The EU and US talk all the time, through the ICN, through the Translatlantic Dialogue, you name it. They both use HH indexes. I generally believe that international economic law harmonization is likely in many things, but antitrust, perhaps because of strong differences in the competition cultures of the two jurisdictions, is probably going to harmonize slower than most. The jurisdictions took very different views about Microsoft, the ICN has been sidetracked into technical training, and antitrust in general is becoming a little like accounting, where Europe has the world's standard, and the US has the idiosyncratic one. Unlike in acccounting, however, the pressure to change American exceptionalism is not likely to be as great. Anyway, the UPS-TNT deal's undoing underscores this. America has blocked mergers - it blocked T-Mobile - AT&T - but this doesn't feel like something that would have suffered the same fate in the American context. Accounting firms in China have found themselves on the horns of a dilemma as of yesterday, as the SEC launched administrative proceedings against pretty much all of them for "for refusing to produce audit work papers and other documents related to China-based companies under investigation by the SEC for potential accounting fraud against U.S. investors," as the agency put it. The claim is administrative (i.e., not in court, but headed before an agency ALJ), and you can look at it here. Each of the Respondents has informed the Commission that it will not produce the documents to the Commission as requested in the Section 106 requests because, among other things, Respondents interpret the law of the People’s Republic of China as prohibiting Respondents from doing so. What is really needed here is an agreement with the Chinese government on access to the papers the SEC believes is required. Without it, the agency is going to have to either take it easy or delist a lot of Chinese companies; this action appears to be a signal that it is serious about doing the latter. But I'd say the target here are not the accounting firms named in the complaint, but the Chinese regulators standing behind them. On Thursday, I travelled to Houston and gave a statement before the Public Company Accounting Oversight Board in a roundtable hearing, as the PCAOB considers whether to impose a mandatory auditor rotation rule. In using its new inspection powers, the PCAOB has found worrying evidence of auditors compromising their independence, objectivity, and professional skepticism (see the PCAOB’s concept release soliciting public feedback). This problem and whether mandatory auditor rotation is an appropriate solution present a bramble bush of questions that have solicited a great deal of comments (you can see the statements at the Houston roundtable (including my own) here); the PCAOB also held roundtables previously in Washington, D.C. and San Francisco). For me, the roundtable represented an opportunity to revisit some of the legal scholarship on audit failure that deserves renewed attention, even as public attention has shifted from Enron/SOX to “Subprime”/Dodd-Frank. Let me highlight the works of two scholars in particular. First, Sean O’Connor (Univ. of Washington) authored a great series of articles that examined “the creation” of the problem of auditor independence. In one work, O’Connor looks at how certain accountants pushed for, and Congress created, requirements for mandatory “independent” auditing of issuer financial statements in public offerings (the ’33 Act) and in periodic reporting (the ’34 Act). Professor O’Connor looks at how the New Deal Congress imported much of these requirements from provisions in Britain’s Companies Act but without considering key differences in status and governance between chartered accountants in Britain versus the accounting industry in the United States. Moreover, Congress failed to spell out what makes auditors “independent.” This omission left the job to the SEC and resulted in Boards and not shareholders selecting and paying auditors. In a later work, O’Connor looks at how these legal requirements and the “issuer pays” model mean that true auditor independence will always be elusive. His work parallels work in other scholarship on gatekeepers (for example, Frank Partnoy’s theory of how “regulatory licenses” endow credit rating agencies with government-granted oligopoly power that undermines their effective gatekeeping). O’Connor presents a fairly radical set of solutions, including ending the ’34 Act (but not the ’33 Act) statutory requirements for independent audits and giving shareholders control of auditor selection. Bill Bratton (Penn) had a second and different spin on the problem of auditor independence. He agrees that the issuer-pays model fundamentally compromises auditor independence. But, he argues that making auditors responsive to shareholders is problematic, as different groups of shareholders have radically different investing interests and time horizons. This article represents part of a series of articles by Bratton on the “dark side” of shareholder value and the downsides of shareholder primacy. Instead of making auditors beholden to shareholder, Bratton recommends strengthening the fidelity of auditors to accounting rules. Less radical than O’Connor’s suggestions, Bratton’s proposal raises a number of questions, including whether fidelity to rules can provide adequate discipline of audit firms without a third-party strenuously enforcing those rules on behalf of shareholders, whether professional and social norms provide a meaningful disciplining device for auditors, and, most vexing, how effective can rules be when industry wields a powerful hand in writing them. Both sets of works deserve renewed scrutiny as the problems of auditor independence persist.